Gustavus Adolphus senior Kaelene Lundstrum and junior Sam Broderius represented the Gustavus women's outdoor track and field team in the final day of competition at the Division III NCAA Outdoor Track and Field Championships held on the campus of Baldwin-Wallace College in Berea, Ohio. 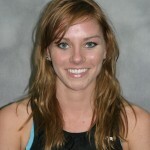 Lundstrum competed in the high jump, finishing 16th after clearing 5' 3.75". Broderius competed in the discus, finishing fourth in heat #2 with a throw of 135’ 11”, yet not making the finals. The Gusties finished tied for 44th place after compiling five points at the three-day event. 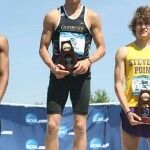 Gustavus Adolphus senior Max Hanson highlighted the final day of the 2010 NCAA Outdoor Track and Field Championships by winning the 800-meter run with a time of 1:49.50. 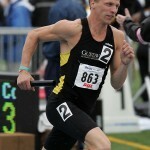 Hanson also joined Cole Carlson, Colby Citrowske, and Matt Leeb in a second place finish in the 400-meter relay (3:12.82) to cap off the 2010 NCAA Championships. Select members of the Gustavus men’s and women’s track and field teams competed in the second day of competition at the Division III NCAA Outdoor Track and Field Championships being held on the campus of Baldwin-Wallace College in Berea, Ohio. Gustavus Adolphus sophomore Amrik Donkena (Rochester, Minn.) saw his appearance in the 2010 NCAA Division III Men's Tennis Singles Championship come to an abrupt end with a heartbreaking 6-7, 4-6 loss in the first round to Mike Mattelson of Vassar College on Friday morning in Oberlin, Ohio. Gustavus Adolphus senior Sierra Krebsbach (North Oaks, Minn.) was defeated in the first round of the singles competition at the NCAA Championships by the College of New Jersey's Jackie Shtemberg. Select members of the Gustavus men’s and women’s track and field teams took part in the first day of competition at the Division III NCAA Outdoor Track and Field Championships being held on the campus of Baldwin-Wallace College in Berea, Ohio. As a junior health fitness major, Janey Helland has already accomplished more in three years at Gustavus than many accomplish in four years. Helland has spent her entire collegiate career managing her time between track and field, volleyball and class work while achieving great success in all three phases. Helland embodies the ideal student-athlete and the Division III experience. The Gustavus women’s tennis team had its season come to a close with a 5-0 loss to number two seed Williams in the quarterfinals of the NCAA Championship on Tuesday afternoon in Fredericksburg, Va. The Gusties were swept in doubles, before suffering losses at #2 and #3 singles. Gustavus Adolphus junior Janey Helland (Mapleton, Minn) has been named the Central Region Women’s Field Athlete of the Year by the U.S. Track & Field and Cross Country Coaches Association (USTFCCCA). Gustavus Adolphus senior Max Hanson (Montrose, Minn.) has been honored as the Central Region Men’s Track Athlete of the Year by the U.S. Track and Field and Cross Country Coaches Association (USTFCCCA).